A 20-year-old Florida man is in police custody after allegedly shaking his infant son to death. 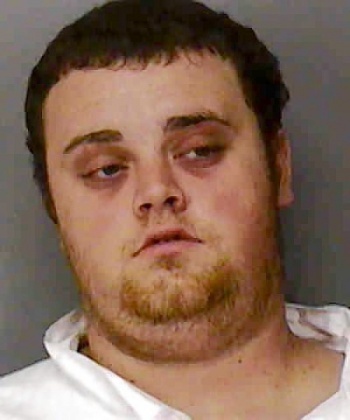 Jacob Hartley (mugshot at right) is currently charged with aggravated manslaughter of a child and aggravated child abuse following two incidents in which he shook his three-week-old infant son, leading to the child's death. Ah, but why did Mr. Hartley kill his offspring? According to police reports and the initial testimony of the child's mother, this act of violence was Hartley's response to his son's incessant crying. On Thursday, the boy's mother, Amber Newton, said Hartley played video games from about 10 a.m. to 2:30 p.m.
During his video game session Hartley held his son for about 30 minutes. At one point Hartley used both hands to pick up the boy and shake him while saying, "Damn you Colton, please go to [expletive] sleep." That's when Newton took the child from Hartley, according to a Hartley's arrest affidavit. After playing his Xbox for several hours Hartley went to work at Sam's Club, where he stocked produce, according to Sheriff's records. When he returned to his Lakeland home after work, Hartley again played video games until 4 a.m. Friday. The infant woke up and began crying around the time Hartley went to bed. While Newton prepared a bottle for the baby, Hartley held the boy on his chest, reports show. Hartley claims he fell asleep and woke up a short time later to find Newton holding their son, who was unresponsive. Newton noticed that the child was bleeding from the nose and mouth and immediately rushed it to the hospital where it died a few hours later. Doctors there claim the child's injuries "were consistent with being shaken." When confronted by authorities Jacob Hartley admitted to shaking the infant, and was immediately placed under arrest. He is currently awaiting trial in Florida's Polk County Jail. Though its commonplace (and disturbing acceptable) to try these sorts of issues in the media, that seems crass here. You can draw your own conclusions about this case. Please deposit all vitriol and existential worry for the human species as a whole in the comments below.